Pope Benedict will go to jail for twenty five years for his role in Crimes against Humanity, and Vatican wealth and property is to be seized, according to today’s historic verdict of the International Common Law Court of Justice. The Brussels-based Court handed down a unanimous guilty verdict from its Citizen Jurors and ordered the citizens’ arrest of thirty Defendants commencing March 4 in a Court Order issued to them today. “The Defendants are ordered to surrender themselves voluntarily to Peace Officers and Agents authorized by this COURT, having been found Guilty as charged. “The Defendants have seven days from the issuing of this ORDER, until March 4, 2103, to comply. After March 4, 2013, an International Arrest Warrant will be issued against these Defendants”. These exhibits detailed irrefutable proof of a massive criminal conspiracy by the Defendants’ institutions to commit and conceal Genocide on generations of children in so-called Indian residential schools across Canada. “Their silence told me a lot. Why wouldn’t innocent people defend their own reputation when accused of such horrible things?” commented one Juror, based in England. “These crimes were aimed at children, and were a cold and calculated plan to wipe out Indians who weren’t Christians. And the defendants clearly are still covering up this crime. So we felt we had to do more than slap their wrist. The whole reign of terror by state-backed churches that are above the law has to end, because children still suffer from it”. 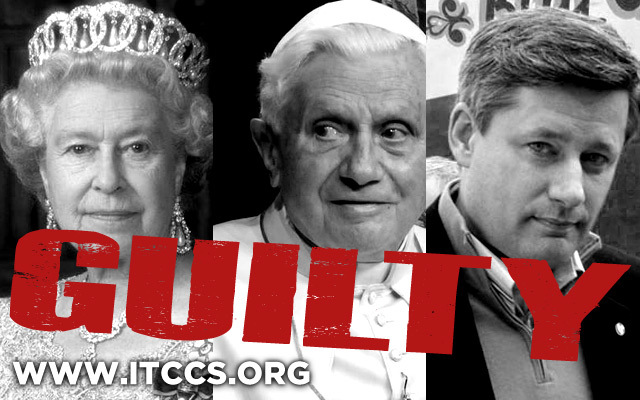 The Court’s judgement declares the wealth and property of the churches responsible for the Canadian genocide to be forfeited and placed under public ownership, as reparations for the families of the more than 50,000 children who died in the residential schools. The citizens’ arrests of these and other Defendants will commence on March 4 if they do not surrender themselves and their assets, as per the Court Order. These actions will be filmed and posted at here in the coming week, along with further updates from the Court and its Citizen Agents.